C.H.Erbslöh will be present at the ZVO Oberflächentage in Dusseldorf from 21.09.2011 – 23.09.2011. We will inform you about the newest products of Electroplating and Surface Technologies as well as Waste Water Treatment. 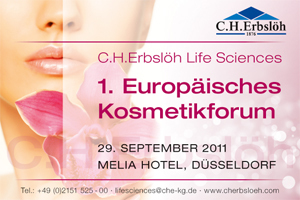 C.H.Erbslöh will be present at the Eurofinish in Gent from 27.09.2011 – 29.09.2011. We will inform you about the newest products of Electroplating and Surface Technologies as well as Waste Water Treatment. September 29, 2011 – Melia Hotel, Düsseldorf. Effectiveness – Tolerance – Responsibility, Skin- and hair care of the next generation. With the contribution of BASF Beauty Care Solutions, Gova Ingredients, Rhodia Novecare. C.H.Erbslöh, together with its subsidiaries from Austria, Switzerland and The Netherlands, will present the latest highlights in cosmetic raw and active materials at the 58th Sepawa Congress in Fulda from 12th until 14th of October. We are glad to welcome you at our stand 454-455. C.H.Erbslöh presents new and established products. We are glad to welcome you at our booth A4-4006, hall A4. C.H.Erbslöh GmbH & Co. KG will participate in the "Lange Nacht der Industrie" on 20th October 2011. Visit us and discover a fascinating insight into the acitivities of a speciality chemicals and industrial minerals distributor. We are pleased with your participation. LEL the European Group of Technical Distribution Specialists will have a booth at CPHI in Frankfurt, Hall 3.1 Booth A45.Germany, Austria, Poland, Hungary, France, Spain, Portugal and the United Kingdom will be represented by LEL Members introducing their continuously growing portfolio for the pharmaceutical industry. Our specialists will present products from European and world wide suppliers with both classical and new interesting properties. Get more information about LEL and C.H.Erbslöh by visiting our web pages.